Below is a recent interview between Trisha O’Keefe and AX writer, Sarah White. Trisha: I’m from a little town nestled at the base of the Pocono Mountain region, called Brodheadsville. It’s not quite a town, it’s a ville. Basically lots of trees and ski resorts. I like it though. It’s quiet. I was actually born in Boonton (silent “N”), New Jersey. But Brodheadsville is what I called home for 17 years. Sarah: What other musicians help make up your sound? Trisha: Live, I make up my own sound. Me and the guitar, although I am sometimes joined by my foxy bass-playing sidekick, Mr. Dave Woodman. On my records, it’s been a plethora of musicians that I admire, respect, and am good friends with. I’m privileged to get to hang out with some of these extraordinary players. If schedule’s permit, one day I’ll have them all come play a show with me live. Like a giant buffet of musical delicacies, all on one stage. Sarah: How would you describe your music? Trisha: Edgy, emotional, strong, defiant, anthemic. I have songs that exemplify strength, and I have songs that are about those times when a person’s strength is tested. I write about life, and the reaction to life. With my acoustic guitar. Sarah: If I were at one of your live shows, what could I expect? 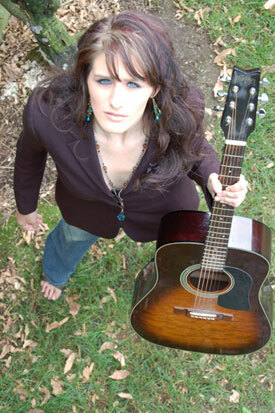 Trisha: Expect to see a show that has a little coffeehouse vibe, but also rocks a little, too. I like to bring the rock, which on acoustic guitar is sometimes hard to do. But, I also like to bring an element of intimacy to my shows, which is why I perform seated (no, it’s not just because I’m lazy), and tell the stories behind the songs. I want the audience to leave the night feeling like they’ve truly gotten to know me as a person, because we’ve connected so deeply through my music. Sarah: Who are some of your influences, musically or otherwise? Trisha: Hmm…Melissa Etheridge – a woman of strength, Ann Wilson – a woman not afraid to use her voice, Sheryl Crow – a woman who managed to make music her way, Alanis Morisette – not afraid to write honestly, Veruca Salt – not afraid to rock in the early 90s, Led Zeppelin – who influenced so many, Elton John, Dolly Parton, Ryan Adams – songwriters who changed my life at different times in my life…the list goes on. Not to mention all of my musician friends I’ve met throughout the years. There is so much beautiful music in the world just waiting to be heard and to inspire. Trisha: I established myself early on in my childhood to be a huge ham. I loved to dance, sing, entertain anyone and everyone around me. When I did those things, it made the people around me smile. There were alot of personal struggles my family had to go through, and I would always want to do something to cheer someone up, so for a minute, you forget about what’s wrong. I’m a people-pleaser. I’m addicted to applause, and making others happy. That set the foundation for me being a performer. As for music, I was interested in Broadway as a kid, so I was a singer. I took piano at a very early age, so I was a musician. And I loved writing poems, so in essence, I was a lyricist. It took me till about the age of 12 to put that all together to be an artist. Then, it was all about playing local carnivals and coffee shops to spread the love to larger audiences. It’s an empire I’ve been building for about 9 years now. Sarah: What was your first gig like? Trisha: My first gig, where I played my own music for an audience of actual patrons (and not just my family)…I was a nervous wreck. I think something happened with either the car or my sound system that caused me to be running late. I blew into the coffeehouse, got myself situated, and introduced myself. Apparently, nerves were getting the better of me, and I came across rather soft-spoken. The room continued to talk and eat and socialize. Then I started to sing, and you could hear a pin drop. It was the coolest moment of my life. I was hooked. It escalated when subsequent shows after, people would be requesting that I play a song of mine, and not their favorite song by Sheryl Crow. That was great, I felt like I was making progress, it was validation that people felt as good about what I was doing as I did. Sarah: What do you want people to take from your live shows, and music in general? Trisha: I think there’s this sense of separation when you come to a show, like “Me, performer. You, audience.”. I guess I can sort of understand that. But for me, I make this music because it gets me through things, and I’ve found it gets others through difficult times as well. Why let there be a separation when we’re sharing in the same moments? I want people to walk away feeling like they were a PART of the show, and not that they were just there to sit and clap. Because it’s not about that for me. I love applause, don’t get me wrong. But I want people to come to a show, and forget about all that they’re carrying in their lives, and leave feeling like they just got to sit down and talk it out with an old friend. Sarah: Where do you see yourself a year from now? Trisha: I don’t know. I accomplish more each year than I ever expect to the year before. It’s kind of a wild ride. Focused efforts, but leaving the end result up to fate. Next year, I’d like to see myself on tour with a major artist, playing lots of lovely exotic locations and having an amazing time on the road, connecting with people in cities everywhere. Sarah: Have you received any awards or press recognition? Have you competed in any contests? Trisha: I’ve gotten a lot of really great press exposure, with articles, reviews, the like. I was a semi-finalist in the AOL First Break competition in 2003, which was a national contest looking for the best undiscovered original artist. That was pretty cool. I don’t typically do contests or singing competitions. I guess it’s just not really my thing. For me, (and forgive a girl for sounding too sappy) the greatest award I have is the career I’ve been able to build for myself. I get to do exactly what I want for a living. How many people can say that? That’s enough for me. Sarah: Are you featured on any radio stations? Trisha: I’m on about 100 college/commercial stations throughout the country. As a note to all your readers: Request one of my songs on your local radio, or college station, and if they say they don’t carry my CD, email me and let me know, I’ll gladly send one their way. WXPN Philadelphia and WBZC have been really supportive, as well as Northeast PA stations WSBG and WZZO. Those two really gave me my start back home. Sarah: What is your management team / promotional plan like? Trisha: I wear all the hats when it comes to my career. I am my management, my booking, my promotion, and I also have to be the artist, writing the material and playing shows when I’m not busy booking shows. It’s a full time job. From the minute I wake up until the time I go to bed, which isn’t usually until 2 or 3 a.m., I’m eating, living, and breathing my career. It’s all about forward thinking, whether I’m laying the groundwork for the next few weeks or months, or being on the ball enough to spot last-minute opportunities when they present themselves. It’s a lot to think about. Sarah: Are you signed to any label? Would you like to be? Trisha: I think for me, it’s about working with the right label. I’ve been afforded the chance to work with some really wonderful people over the past 9 years, but for one reason or another, it wasn’t the right situation. I believe that all that has happened has prepared me to know how to tell when the right opportunity comes along. 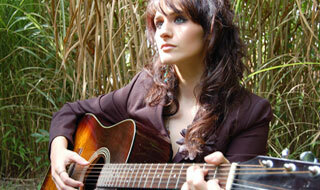 You can find out more about Trisha O’Keefe by visiting www.trishaokeefe.com.